With summer upon us, things have become rather hot. 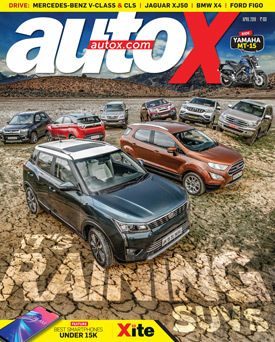 Not unlike our April issue that features some of the hottest-selling compact SUVs and some of the brawniest ones in a mega contest. At one end, there’s Mahindra’s new XUV300 challenging the likes of the Breeza and Nexon, and at the other, we’ve Ford’s updated Endeavour – launched with a few cosmetic tweaks to further its Herculean image – pitted against the latest contender in the segment – Mahindra’s Alturas. The new XUV, with its loud design, segment-first equipment and the most powerful diesel engine in the segment, attempts to push the limits of a compact SUV. The likes of the Endeavour, on the other hand, is a different animal altogether. With its intimidating design, it appeals to those who value road-presence over all else. So, does the new XUV succeed in its aim? And does the Endeavour manage to triumph over its newest rival, the Alturas? Our April issue will give you answers to these questions and more. But that’s not all, we also drive and ride a range of new cars and bikes as varied as a special version of the Jaguar XJ that celebrates 50 years of the iconic XJ nameplate and Yamaha’s new street brawler – the MT-15, along with Mercedes’s new range of off-beat cars for India – the rather practical V-Class and the suave CLS.